This page is dedicated to our "special pets". Click on a thumbnail if you wish to view a picture. First, there was Brandy. In short, Vicki's best friend and inseparable companion. Wherever Vicki was, there was Brandy. 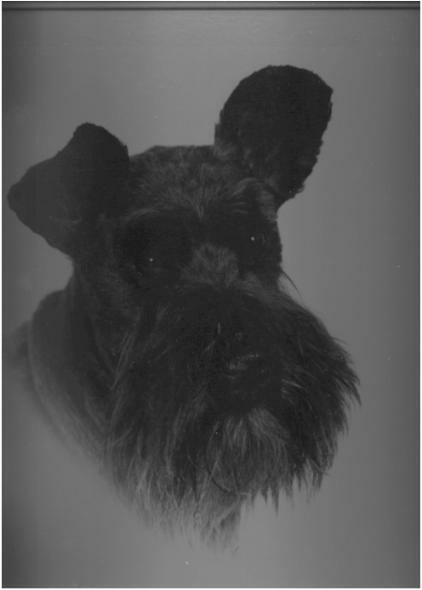 Without her, there would be no Empire Miniature Schnauzers, as her unqualified love and boundless energy soon filled Vicki with an admiration of the breed. Brandy was equally comfortable running on the beach on British Columbia's beautiful Sunshine Coast, sitting in the passenger seat of Vicki's Camaro, nose pointed into the breeze, or curled up in your lap. She was a joy, and make no mistake about it, queen of the house. She pretty much set the rules about who was involved in Vicki's life. As Vicki put it, "Love me...love my dog!" They came as a package. If you didn't cozy up to Brandy, and more importantly, Brandy didn't cozy up to you, you didn't cut it. Brandy gave us 13 years of happy memories. She has been gone for quite some time, but her presence is still felt. One could never forget such a wonderful dog. 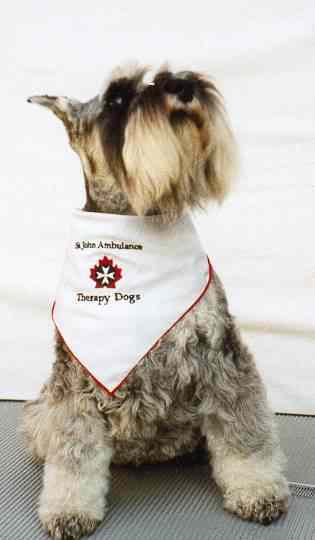 Cassie passed her therapy dog exam November '98 and has grown into the job (just as her nicknames have changed from "Miss Piggy" to "The Rascal" to "Lady Jane".) Last year she visited Trinity Retirement Centre (intermediate care) on an almost weekly visit. She assumed her role the moment she'd walk in the door, and she loved to shake hands and sit on laps (even a lady with severe Parkinsons!). Heilandor's Cassie O'Blanca is a daughter of Am Can Ch Empire's Indigo Moon CD and Ch Scandal's Light My Fire and we are very proud to say we bred her. Cassie allows her half-brother, Charlie, Heilandor's Darlin' Charlie (by Am Can Ch Annfield Ever Ready) to live in the same house and is trying desperately hard to teach him everything she knows. Cassie even lets Charlie go with them to Dad's clinic on occasion. Congratulations to Sandy & Gerry on raising two wonderful ambassadors of the breed. PS - with a bit of help from Bev, Sandy is doing a great job of grooming both kids. And then there was Tessa. At one point, we considered writing a book about the adventures and misadventures of this delightfully goofy and gangly creature. We jokingly called her the prototype for the breed... God made her, and said, "Not bad, but not exactly what I had in mind. I think I'll try again." She was a rather large black, with huge floppy ears. Our veterinarian actually asked if he could put a picture of Tessa in his office to show clients what might happen if ears went uncropped. We spared her that indignity. She came into our house originally as a companion to Brandy when Tessa was a year and a half old. Her call name was "Lucky", but it was apparent she had been anything but...we were her fourth home. We changed her name to "Contessa", or Tessa for short. It was also apparent, she had been abused at some point. She always got along with women, but it took a good six months before she started to trust men. However, once she realized she was in a safe environment, Tessa quickly became everybody's friend, and developed into our goodwill ambassador. If you came to our house, you were most welcome, as long as you understood clearly the reason you were there was to see her. Tessa's idiosyncracies were numerous and wonderful---refusing to go out in the rain to do her business unless you went along ("Hey, if I'm going to get wet, so are you!") --- and they all added to her endearing personality. It was impossible to not laugh at, and love her, and that we did for 14 wonderful years. Even though she's been gone for some time now, we still smile when we think of her. What better legacy can there be. 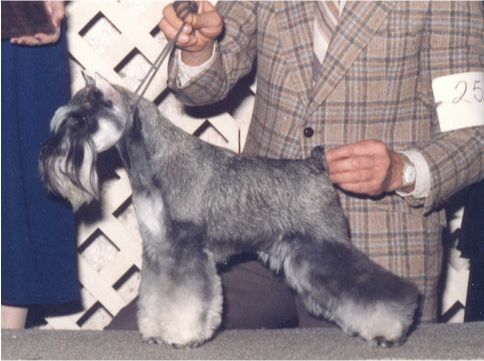 CH Coventry's Shadow Chaser "Tiffany"
This non-stop bundle of energy was our first show dog. As outlined earlier, we really did not have a clue about what we were doing when we began . Hence the name "Coventry." How were we supposed to know you actually had to register these things? How we were to know there was such a thing as a Miniature Schnauzer Club of Canada? How were we supposed to know you shouldn't buy a show dog from a newspaper advertisement? Nonetheless, this is exactly what we did and, in blissful ignorance, off to the show ring we went. 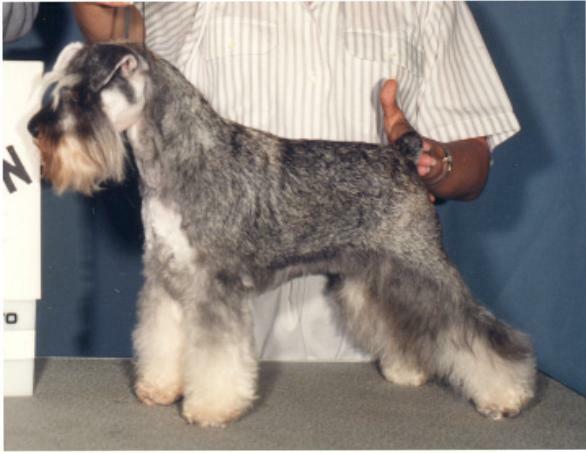 It was there we learned about all of the above, and with the much-appreciated guidance of other successful and highly-recognized breeders, began to understand what it takes to produce, evaluate, groom, and show a quality miniature schnauzer. For all of this, Tiffany was our practice dog, and she endured it with great enthusiasm. Tiffany was extremely cute, but as we quickly figured out, cute isn't one of the primary considerations of judges. Despite her faults from a confirmation standpoint, she showed her heart out. She loved it in the ring. Some 28 shows later, her energy and attitude plus Vicki's perseverance earned her a Canadian title, our first. Tiffany was retired immediately, and never bred, but she was very much loved. She became the loving companion of Vicki's mother and father, and we are happy to report she lived out her days as an extremely pampered, spoiled house pet. To Tiffany, we say a heartfelt "Thanks."